First of all, these are absolutely adorable! 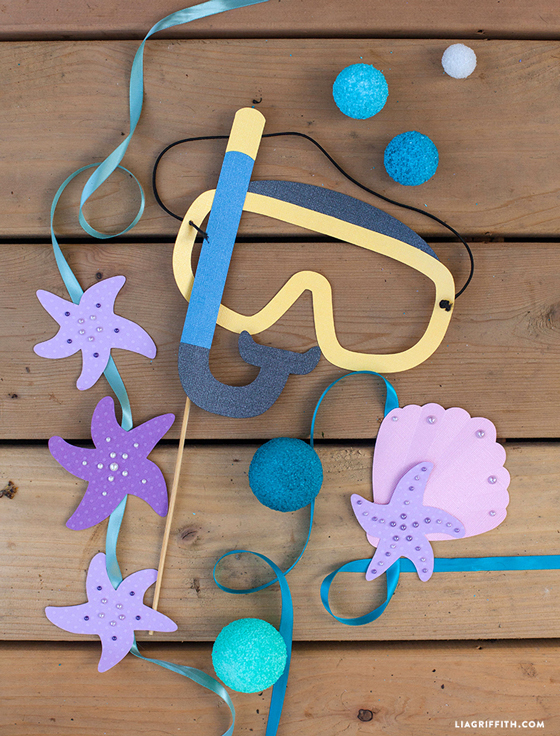 I can’t wait to use these props as well as the other “Under the Sea” birthday items for my son’s 3rd birthday! 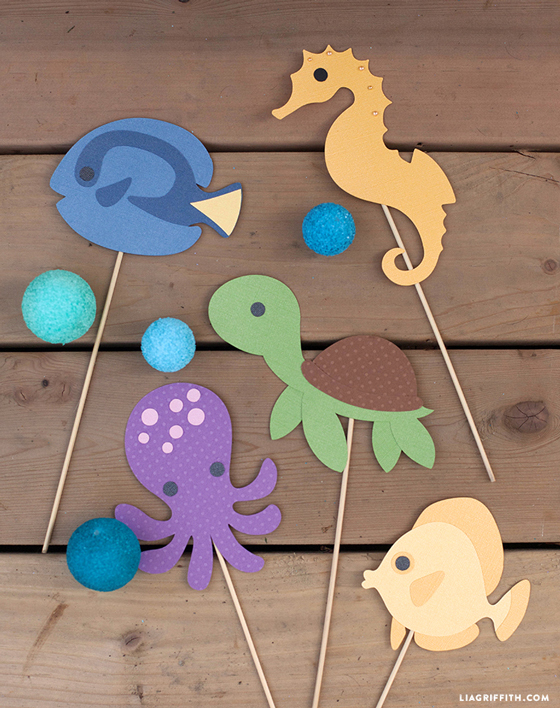 Just curios, though, what did you use for the shiny spots on the seashells, starfish, and seahorse? Are they faux pearls, or something else? Yay how fun! Yes, they are faux pearl stickers. I found these at Michaels in the sticker section. What did you use to print the props on? Cardstock? They’re adorable!! Can you explain the fishing wire and tape method for hanging the styrofoam? We just wrapped tape around one end of the fishing wire to create a stiff make-shift needle to poke through the foam. To prevent the foam pieces from sliding down, I suggest tying knots in the wire. I can’t see how it is hanging. 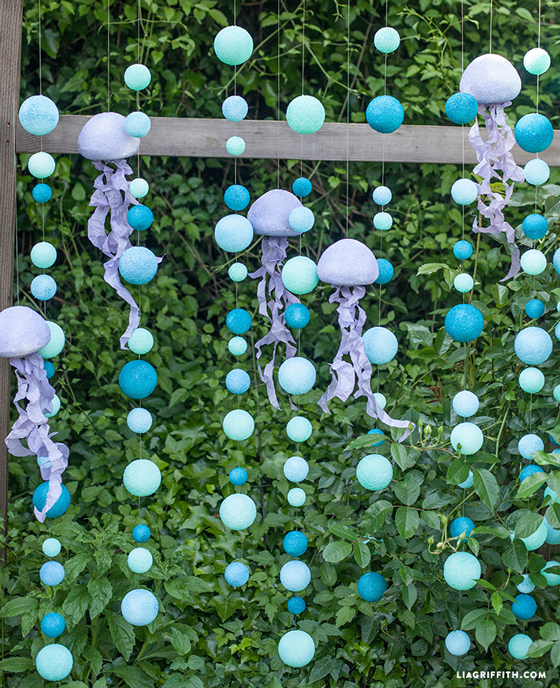 Would this be something I could hang on my daughter’s wall as a decoration for her under the sea themed room? I love this for my goddaughter’s 1st birthday party. But I just my experience spray paint makes Styrofoam melt? Did you experience anything like that? Oh nooo…. We did not have a problem with the styrofoam melting, we still have ours a year later. Oh no wallpaper!! I would prefer paper that has the sticky side already so I could use it for the back of bookshelves or to wrap a notebook 🙂 please!! Stay tune for some exciting news, it is not wall paper but might work for a note book! I love your blog! You are amazing! 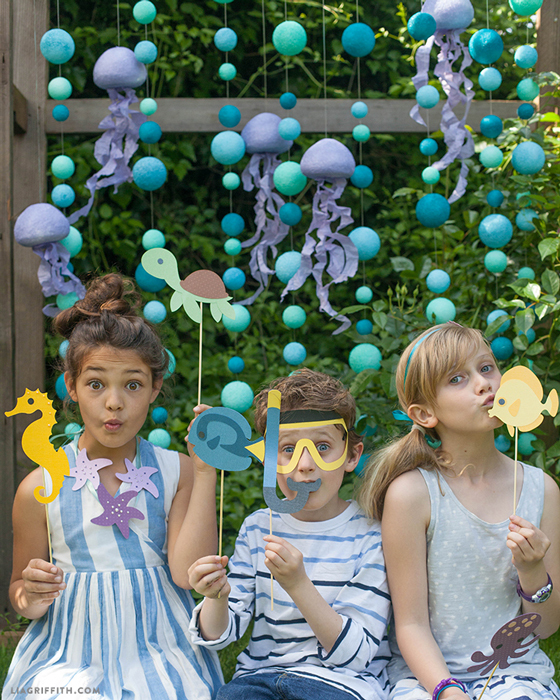 My daughter’s party will be seabed party! I loved this ideia! Thank you and Happy Early Birthday to your daughter! Thank you, I am really excited! 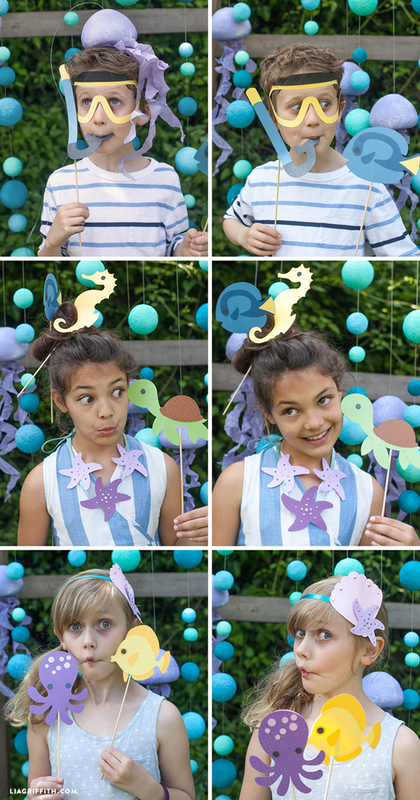 Oh my gosh, Lia, these are so cute. My 12 year old granddaughter is obsessed with mermaids and these would be perfect for decorations in her room. For her birthday she wanted a mermaid tail she could wear. She got one from her mother that she paid $135 for. She says it’s not as easy to swim in as she thought it would be, but she’s so proud of it. Thank you so much for all you do and your big heart that let’s you give it away to us that don’t have near the creativity that you do. This is adorable! 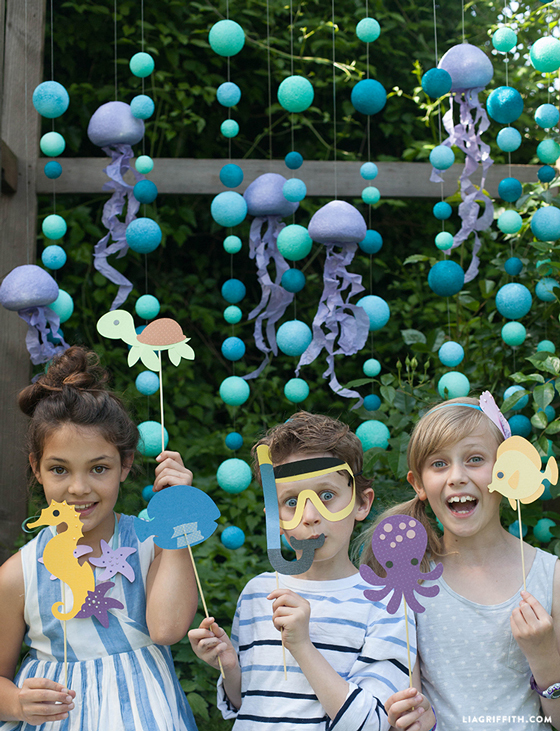 Such a fun idea for a pool party, too. Thank you. Soooo cute, I love this ! Thanks for this great idea.